In addition, there are a wide variety of news stories online focusing on the top gay men's dating apps as a growing source attributed to the rising instances of HIV and STD infections in gay men worldwide. These apps have been called out by name, including Grindr, Scruff, Growlr, Jack'd and Hornet. Thus, in the fight for HIV and STD prevention, these and other advertisers are going straight to the source, focusing their ad campaigns primarily on geo-targeted campaigns that can both drive awareness of and traffic to HIV and STD testing and prevention centers in their area. We have been servicing a growing number of these ad campaigns, with each one being geo-targeted to a local HIV and STD testing and prevention center. The primary benefit to working with our company is that we are a one-stop shop for reaching gay men on ALL of the top gay dating apps, not just a few. Utilizing programmatic ad technology, we are able to target gay men on ALL of the top gay dating apps and focus those ads on just the regions they need to help get the word out. In addition, the hashtag #PrEP is quite strong, being utilized by many HIV Prevention resources online. We're able to tap into these online conversations on your company's behalf, sharing your social media posts and photos with these groups on Facebook, LinkedIn, Google Plus, etc., as well as including your company in those articles and posts found on Twitter and Instagram utilizing the #PrEP hashtag. Looking to advertise to this target LGBT audience? We work with any budgets (starting at $500 per month)... call us at (323) 963-3653 or contact us here to get started. Targeting the HIV+ community online has often been more of a challenge than targeting other demographics within the LGBT community online. Due to some of the sensitivities involved in both individuals self-identifying as being HIV+, as well as hesitance on the part of some of those individuals taking PrEP drugs and publicly disclosing this fact, reaching this community with online advertising has often been more general in nature, placing ads on gay male social media/hook-up apps and sites, as well as general websites online with a more male viewership. With the advent of programmatic ad targeting in the LGBT community, this community can now be more easily reached than ever before. 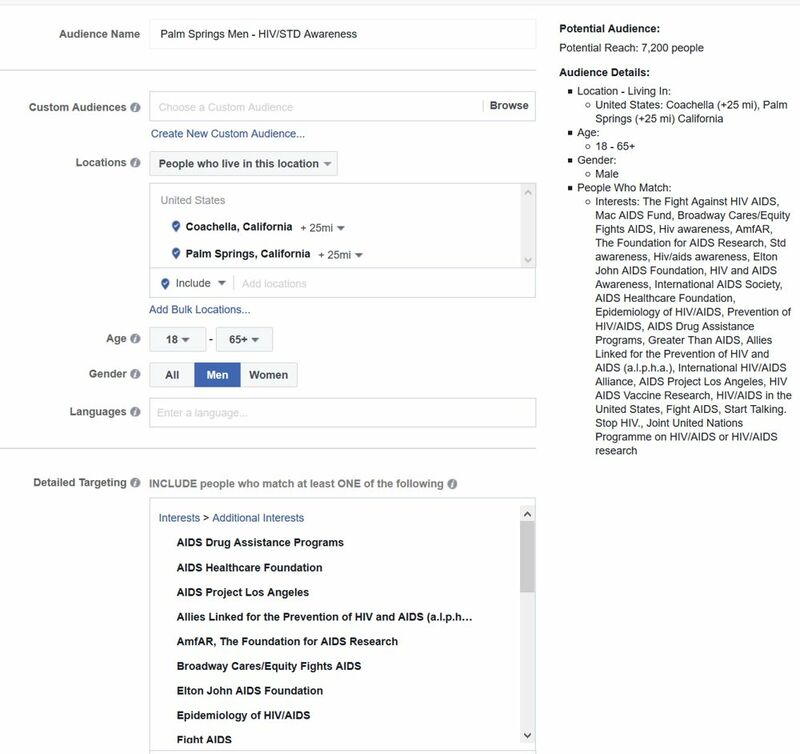 Utilizing Oracle BlueKai's powerful Audience Data Marketplace, as well as other data sources including Datanics, Lotame, Epsilon, Nielsen, Dun & Bradstreet and Experian, we now have the ability to deliver a connection between a "real world" audience and that same audience using the Internet. One of our stronger audience selects is "AIDS Research and Support". There are strong communities of HIV+ Gay Men on social media, which can be targeted via social media and Facebook advertising. In addition, the hashtag #HIV is quite strong, being utilized by many HIV+ resources online. We're able to tap into these online conversations on your company's behalf, sharing your social media posts and photos with these groups on Facebook, LinkedIn, Google Plus, etc., as well as including your company in those articles and posts found on Twitter and Instagram utilizing the #HIV hashtag. For more detailed information on this marketing program and strategy, Click Here. For more detailed information on this marketing program and strategy, in blog format, Click Here.